Many people including me are facing too many bugs on Micromax Unite 2 A106 like frequent hangs, sometime the phone strucks and we need to put the battery again to fix it. Another bug is about OTG cable in Micromax A106. Also battery draining, SD Card problems also exist in the Unite 2. One day when I saw on Facebook, My|Phone Rio Lite's group, I saw that they uploaded their Jelly Bean ROM. I flashed it and it worked. It worked absolutely fine, even with it's preloader and all files. Then I planned to make an easy guide for newbies to downgrade their MMX Unite 2 to Android 4.2.2 Jelly Bean OS. To fix battery draining problem. To fix the OTG bug. To get a more stable ROM. Download the Jelly Bean firmware by Gregson from Google Drive. Download the Smart Phone Flasher (SP Flash Tool) from Google Drive. Download USB Drivers for your Windows PC from Google Drive. Install the drivers into your PC. Backup your ROM from MTK Droid Root & Tools or download my Stock Firmware (Unrooted with stock recovery) from SGT. Extract the SP Tools and open an executable file: flash_tool.exe. Select Scatter loading from the tool and navigate to MT6582_Android_scatter_emmc.txt file present in the Stock Firmware of RIO LITE which you just now extracted. All files will load automatically. In cache and data, select your protect files or simply select secro.img for both the files from the Rio Lite firmware. You will see a text "Download only". Tap on it and you'll get a drop down menu. Select Firmware upgrade on it. Now select that big green Download button to start off. Remove the battery of your phone and add it back again. Now plug in the USB and the downloading will start without any errors. Now untick all the files in "Download" section (Android, cache etc) and tick only "Preloader". Now select preloader.bin of MICROMAX UNITE 2!! Select that big Download button again and make sure it is is in DOWNLOAD ONLY mode only. Let it finish it work. You will see an error about encryption. Shut down the phone and press and hold Volume up and down + Power keys for some seconds. Press Volume UP button to go to Recovery. Press "Menu" (left most soft key) to see the options. Scroll down with Volume down button and select wipe user data/factory reset. Select it using Menu button again, and confirm it with Menu button only! Phone doesn't boot after performing the whole guide: It is because you flashed the prelodoader of MMX Unite 2 in the ROM.. Now select MMX Unite 2's scatter file and then try to perform the Write Memory steps again. Failed? If so then flash the whole firmware of MMX Unite 2 again to make the device normal and bootable. Get the stock firmware from here.. If still doesn't boot then just do till Firmware Upgrade in the guide. I get an error which says PMT partition has been changed: Select Firmware upgrade to fix this problem and then flash JB ROM..but while flashing Prelaoder, make sure only Download ONLY is selected. The download doesn't start: Install the USB Drivers properly and make sure that they're working (try using ADB) and also make sure you plug out the battery and then put it again. Without pressing Power button you should put the USB cable! I get only 512 MB RAM: Don't worry, it's just a Preloader problem, you did it wrong! Flash our prelaoder using their scatter file..
Click here to see how to flash the stock firmware again to get back to KK. Flash the stock firmware..;) Just flash the preloader.bin from "Download" button and using Rio Lite's Scatter file..it should work. Wipe the user data to fix that issue. Add "system.ext4.img" as "Android"!! Firmware ugprade need all files!! i followed ur guide for downgrade...but now no network at all....which .apk file in system shud i replace for solving netwrk issue....??? i can replace phone.apk or phoneprovider.apk or any other systm app,if it give result..
No APK should be placed to get network. 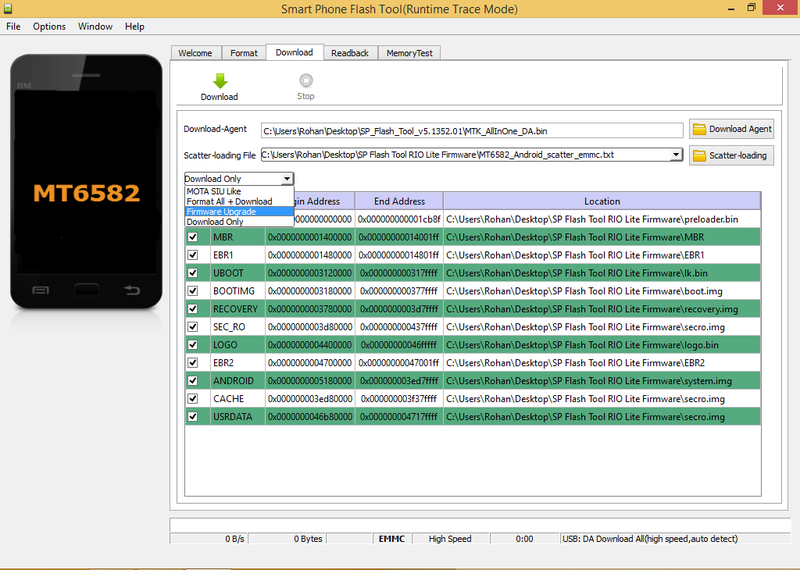 Write IMEI by MTK Droid Root & Tools. preloader.bin Where to get it and iwhat to doo plz help i am geting 512 mb of ram!! hi sir we can install apps + data to sdcard on kitkat . can we do on jellybean as default because i want to install apps with big data. can we only fix otg cable problem for pendrive support without root?????? Sir how to roll back kitkat link not work.